Social value is an indication of the impact on a particular aspect of human welfare. Whereas in a seemingly contrasting light, we often associate contemporary art with a sense of freedom, of something unexpected – ‘stand[ing] outside this realm of rigid instrumentality’. This essay aims to illustrate some intersection between the two, from site-specific installation Suspended by Arabella Dorman currently in Canterbury Cathedral and Les Colombes by Michael Pendry currently in Salisbury Cathedral. For both pieces I will address the significance of subject-matter and their situation in site and consequently discuss the wider implication of contemporary artworks to our society. The subject matter in both pieces is developed to ‘give a voice to groups’ in contrast to expressing individual style. This allows the subject to be the preliminary focus of the installation, while the artists adapt the role of an impartial presenter – introducing the subject into the space. Both Suspended and Les Colombes are installed in the nave of a cathedral that has enhanced the bodily presence of individuals through objects. At first glance, both artworks incorporate a contrast in texture from the stone masonry of the cathedral interior, which immediately attracts our attention. We as audiences are invited to form emotional connections to the exhibited objects by taking a closer look at particular elements draws out details from the grand cluster of objects. Those instances function as powerful narratives whilst leaving space for imagination. In Suspended, the object voices the uncertainty in the refugee crisis. Figure 1 illustrates one instance – viewers are invited to contemplate the situation of its previous owner: the clothing was worn by a toddler who we cannot see but is represented by the clothes. We are unable to know his exact identity but we sympathise with what he has gone through in pursuing a safer life. The impression of his first Christmas may have been blurred, in the same way that his memory of the difficulties in this journey will become dusty by the time he settles down; yet his future is not immediately visible, undefined by the anxious anticipation in refugee camps. This particular instance entails the state of being suspended – stuck ‘between a past to which they cannot return, and a future to which they cannot move forward.’ Such a concept is reinforced by the display where the clothing is paused in suspension, prevented from returning to the top or landing onto the floor. The sense of despair and vulnerability of the refugees is reflected from the softness of fabrics, for that they do not have the power to decide the next step but only to wait. The hardship can be comprehended by looking at the clothes that represents the belonging which the refugees were forced to abandon. 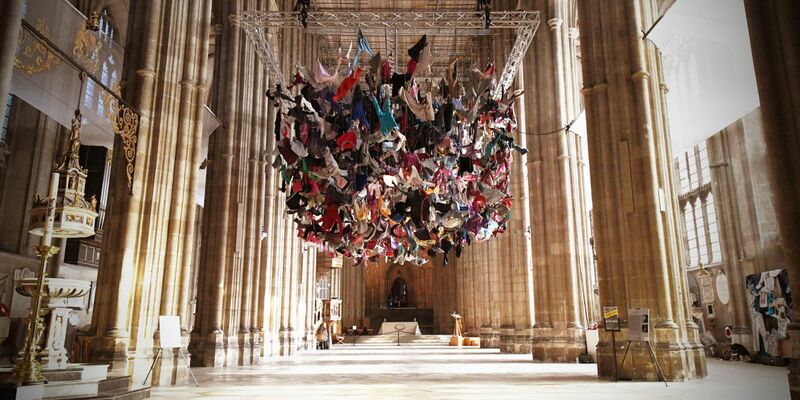 Even when we cannot be in contact with the refugee directly; through looking at Dorman’s installation, our empathy is evoked for the refugees on the European island, from their indirect presence represented by the suspended clothes. A similar connection can be made in Les Colombes, where the doves visualise the universal appeal for peace by grouping the individual components. 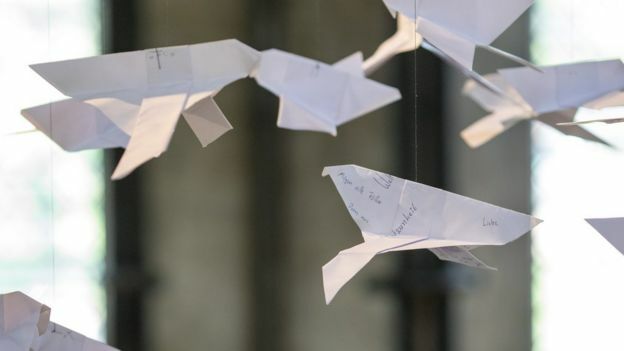 The original 2,500 origami doves in the current display are joined by new ones, as they were created by individuals from the community while the installation was exhibited at different locations. Figure 2 includes the detail of one particular dove among many others: though we cannot read the written wishes in entity, perhaps we can guess its contributor’s intention. A parallel can be drawn to the use of visual form as a universal way to communicative beyond language: the doves materialise the shared hope as effectively as any sentences in any languages do. In such detail we can see both the variety of hope entailed in the writing – when this dove is examined closely, and the uniformity among all wishes for peace – when it is situated in the flock while viewing from afar. 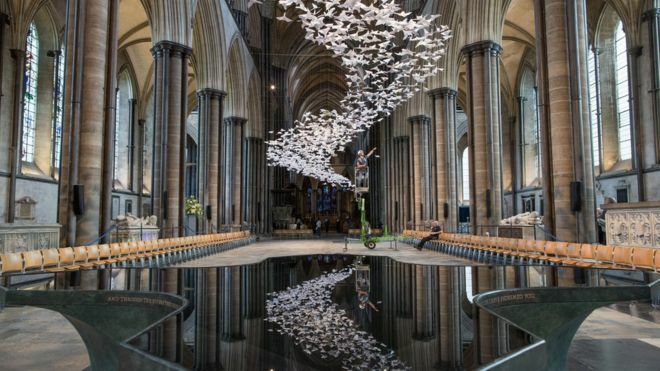 This individual object resonates the meaning central to the composition: the aspiration for ‘a fundamental human right – the right to peace and freedom.’ The entity – which lies in the symbolism of dove, and the particulars – prayers and longings from various communities, coexist in harmony to transmit the message of peace in Salisbury Cathedral. Despite of being an indicator to the relation between an individual to a community, the installation also functions as a reminder of the preceding and the recent historical events which the Salisbury community has experienced. Its initial narrative was retrospective to 1918 – commemorating the ‘centenary of the end of World War One’. Another layer of meaning is added from the recent nerve agent attack on the former Russian spy Sergei Skripal two months ago in this town. The installation embraces the potentiality of movement yet remains still, signifying the impact of history to the Salisbury community. While we are the doves moving into a brand-new era towards the ideal destination of perpetual peace, the past is always memorialised by the present and alerting us to the future; in the same way the doves carry the written messages to the flock. Hence Les Colombes constantly reminds us of the importance of conciliation in coexistence through its tranquil presence in the Cathedral. The situation of both works in a cathedral nave is also complimentary to the sublime quality which the object resembles. Traditions of visitors arriving at the cathedral purposefully to suffice their spiritual need remain unchanged in time, where the significance of the Church space can be traced back to the medieval time. Memory is reinforced through other sensations when objects were seen and felt by the Christians: ‘to remember […] places of pilgrimage, and episodes in the life of Christ.’ To maintain this concept in practice – of handling an object as a devotional gesture to divert tribute and reverence to a sacred being – was attached to the role of the Church as a shrine for hosting relics and religious icons. The role of the cathedral is equally necessary for both installations, as the hosting place guiding the visitors into contemplating the social implication attached to the meaning behind the objects. In the process of seeking for connotations from their appearances, both installations can be seen as an embodiment of certain social implications of the current status-quo – Suspended as an encounter with the refugee crisis which has faded from the news report and slipped away from our sight whose lives are rested upon a stable community; Les Colombes as a response to changing international relationships reminding us that peacefulness is the universal principle in diplomacy. Neither of the cases can achieve its full effect without the consideration of interaction – where audiences’ experience motivates the layout of the installation particularly customised to a public sphere. The openness to participation is crucial in contemporary art because it allows wider social implications to be drawn in a practical dimension. The integration of Les Colombes into the cathedral space flags a particular concern for Pendry, by which the installation is deliberately planned not to visually overwhelm the space. As he notes that ‘churches are institutions that have another purpose than exhibiting art installations […] [so] you always have to find a way not to disturb too much and still get the most out of it.’ The involvement from the public sphere seems less evident at first glance, yet it infiltrates into the production of a multiple-media installation. Besides what we know of the audiences’ creation of new dove members to the original flock, the launch of Les Colombes in London and Israel features Yonotan Maimon’s music which was composed thanks to a friendship developed between the Israeli musician and the German artist. The transnational collaboration exemplifies the theme of multiculturalism in contemporary art which has been ever so relevant to this century due to globalisation. The identity of this installation – with neither fixed authority nor nationality – fits with its condition of touring around the world, welcoming participation from different cultures. Insofar as its multimedia format corresponds with the multicultural element, this display welcomes influences from different societies around the globe. If Les Colombes can be seen as a multicultural sign, Suspended creates a more profound response targeting the particular issue which Pope Francis described as ‘globalisation of indifference’. From the perspective of audiences at St James’s Church and Canterbury Cathedral, Dorman provides the chance to be involved through touching the interactive wall, in addition to the discourse with the piece through the eyes and the intellect. The tactile sensation evokes a genuine experience of being literally in contact with the refugees, so that we can contemplate our social obligations – of what to do to help the refugees when they are equally as real and as alive as we are. There are ways we can do to aid the situation: through donation to the charitable organisation the Starfish Foundation which fulfils many roles supporting the refugees upon their arrival on Lesbos, or in Dorman’s experience – working with refugees to explore ‘the short and long term repercussions of conflict’. Beyond those two ways of fulfilling social obligation which are associated with Suspended, it materialises a reminder to the audiences that the refugee crisis is not one which goes out of sight and out of mind. The unsolved problem is as realistic as the clothes we have felt through touching the interactive wall: although contingently abandoned, the wound from the conflict will not dissolve itself as time passes. On balance, this essay has illustrated one possible way in which we may conceive contemporary artworks as issue-based works inviting the audiences to contemplate our significance as individuals as well as members of society. The installation in situ is understood as continuity to the tradition about the ancient cathedrals and the recent installation, where we remember from the past and reflect these thoughts in future practice.